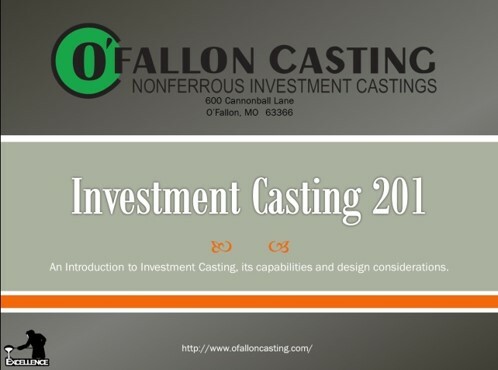 O’Fallon Casting’s “Investment Casting – 201” is a three day class that is structured to provide an in-depth exposure to the Investment Casting process. IC-201 is held at O’Fallon Casting and combines “hands on” foundry experiences with three hours of class material. IC-201 is a natural follow-on to O’Fallon Casting’s IC-101 and is intended to increase the depth-of-knowledge of customer Designers, Engineers, Quality Engineers and Procurement personnel. O’Fallon Casting conducts these classes without cost to its customers and will tailor each IC-201 experience to fit the specific needs of that class. To learn more about IC-201 contact your O’Fallon Casting Sales Engineer.